Religious right suddenly decides morality's not important in politics: How in the world did that happen? Throughout its history as a distinct political group, members of the so-called religious right have always made it a point to say that personal morals were important to political leadership. Thanks to Donald Trump's becoming the Republican Party’s nominee against Hillary Clinton, however, it appears that white evangelical Protestants are changing their opinions. People of all demographics have moved toward this opinion since 2011, according to the study, with a majority of white mainline Protestants, Catholics of any race and the religiously unaffiliated all accepting the premise. With just 58 percent agreeing with this notion, Catholics are the group least likely to sign on to a distinction between personal and public ethics. 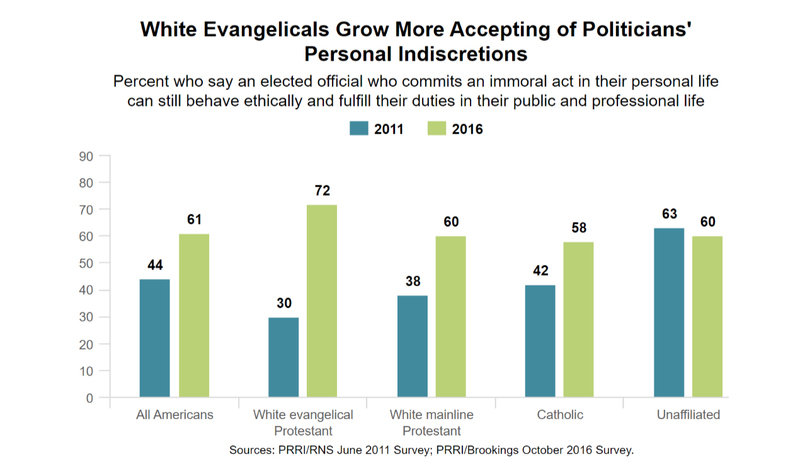 The opinion shift among regular evangelicals described in the PRRI poll seemingly reflects public statements from religious right activists who have been nearly uniform in their acceptance of Trump despite his long history of personal peccadillos. Jerry Falwell Jr., son of the founder of the defunct Moral Majority political action group and now president of Liberty University in Virginia, has been outspoken for months that his support of Trump is predicated on his judgment that the garrulous billionaire is simply the best man for the job. “We hired the best lawyers, accountants and financial management we could find without regard to whether they shared our faith, just like a parent would search for the best doctor for their desperately sick child,” he wrote in an op-ed in January. Falwell also seems to view Trump as a penitent man who has walked away from his sinful past. "He's been through a change in the last four or five years," Falwell said earlier this month in a CNN interview. "He's been influenced strongly by his children, by his grandchildren," he said. "And I don't think he's the man he used to be.” Falwell also added that he would still be willing to support Trump even if the women who alleged that he sexually assaulted them in the past are telling the truth. Tony Perkins, the head of the Family Research Council, has also continued to stand by the Republican nominee, saying that he shares the same political concerns as Trump but not the same personal values. "I can guarantee you what we'll have under Hillary Clinton — it will not be a government that evangelicals and other Americans who love their freedom will enjoy or prosper under,” he said in an Oct. 9 Fox News interview.